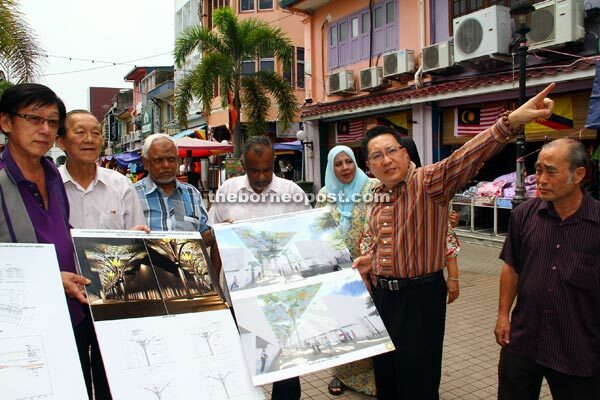 KUCHING: The India Street Pedestrian Mall Committee condemns claims that the proposal for a roof over the pedestrian mall was undertaken without consulting the stakeholders. Its chairman Dato Wee Hong Seng said there had been numerous meetings since the proposal was first mooted to get feedback from everyone. “In 2010, the committee carried out surveys and explained the concept to shop owners and tenants. From there, 74 shop owners and tenants, representing 99 per cent of the members, pledged their support for the project, which was then forwarded to the state government. “The roof covering project has been an idea initiated by the community, and it was only after several meetings and consultations that it was given the go-ahead. It is not true that shop owners were not consulted as claimed by some elected representatives. “We assure that we will protect India Street as we protect our own families and will not do anything that will not benefit businesses there,” he told a press conference at India Street yesterday. Wee said that the project would be calling for open tender soon. “The project has yet to be awarded to any contractor. The relevant details will be shared once the contractor and terms of award are finalised. “Once that has been established, we will inform shop owners. We want to make it clear that India Street will not be closed during the duration of the construction. As with any development, there will be some inconveniences, but steps will be taken to minimise disruption to businesses. Wee said the project might take between 10 months to a year to complete. Wee also debunked claims that shop owners were forced to take down their old signboards and awnings. “All shops are private properties; therefore, DBKU cannot enter without consent to dismantle such signboards and awnings. “The shop owners had agreed to remove old signboards, unused air-con compressors and illegal awnings after DBKU officers had visited them and briefed them individually. The shop owners were given the options as to whether they want the committee to engage a contractor to remove those items or to engage their own contractors. On the holes that have been dug around the pedestrian mall, Wee explained that the small holes were used for soil tests. “Those holes are not for the positioning of pillars, as some had claimed. They are for soil tests carried out by DBKU’s appointed consultant. It is something that must be done before construction commences. “The pillars are necessary to support the rooftop due to the uneven nature of the shoplots. Shop owners requested that the pillars be placed in the centre so that they would not obstruct or affect shopfronts. Wee appealed to everyone concerned to attend meetings whenever they hold one. “If people are concerned with developments going on outside their shops, they should try to attend meetings. We hope that with these facts laid out, all misgivings will be cleared and the elected representatives will also put their support behind this project, which is supported by the local community and is for the long term benefits of the area. “We hope no one uses this project as a political leverage. We welcome any assistance that can be provided by our elected representatives, regardless of their political parties, such as obtaining additional federal grants for the project,” he said.